The Shetland Pony is probably the best known and most recognisable of the pony breeds and is usually the first mount for small children. 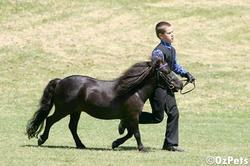 Many city children have their first exposure to a horse with a pony ride on a Shetland pony at a fair or festival. 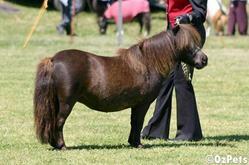 Named after the islands where it originated, the Shetland is perhaps the oldest of the many British horse breeds. The Shetland Islands off the northern coast of Scotland, are mostly barren and have a harsh climate and for many centuries the Shetland Pony lived in the open, protected from the elements only by a thick coat and a long mane and shaggy forelock. The hardiness of the sturdy little Shetland pony with its muscular body and short legs is legendary, as is its strength - on a weight ratio the Shetland is believed to be the strongest equine known, yet it is docile and even the stallions are gentle compared to most other breeds. The Shetland Islanders domesticated the ponies and used them to carry peat down from the bogs to the cottages for use as fuel, and to haul seaweed harvested from the shore to be used as fertiliser on the farms. When the coal mining industry became extensively developed in Britain in the 1800's, Shetlands were imported in great numbers to haul coal cars in the "pits". Many of these ponies were born, worked and died in the mines. Today most Shetland ponies are kept as childrens' pets but many compete in weight-pulling events, shown in halter classes and used for harness driving. and tail hair should be long, straight and profuse and the feathering of the fetlocks straight and silky. As with larger horses, it is important that Shetland ponies be correctly broken in and well handled to ensure reliability. The Shetland is a very intelligent and willing pony if correctly trained and handled, but in the wrong hands its determination earns it an unworthy reputation of being stubborn.